The 34th Surgical Ear Camp undertaken by the Britain Nepal Otology Service was conducted in the Fateh-Bal Eye Hospital, Nepalgunj in the Terai Region of Western Nepal. The surgical camp visits Nepalgunj twice a year and supports the work of the Community Ear Care Programme carried out by BRINOS in partnership with the Nepal Red Cross. 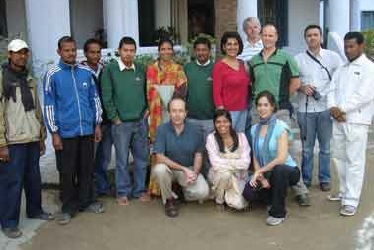 The UK team arrived in Kathmandu on 24th November. The following morning they caught a one hour flight to Nepalgunj in Western Nepal. 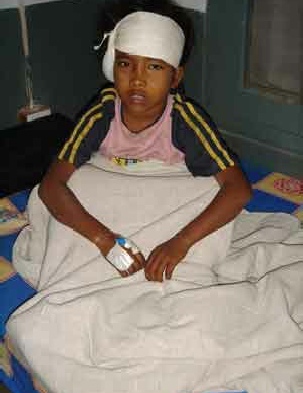 On arrival in Nepalgunj they were transported to the Fateh-Bal Eye Hospital. All the equipment needed for a mobile ear operating theatre is kept in storage. The storage trunks were emptied and three operating tables were set up with two tables undertaking major ear surgery under local anaesthesia and one under general anaesthesia. 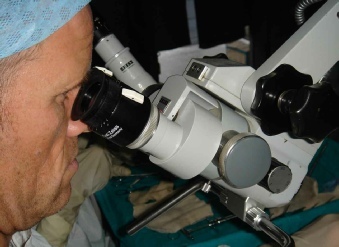 Equipment assembled included operating microscopes, suction, diathermy, surgical drills, an oxygen concentrator and anaesthetic monitoring equipment. Prior to the surgical ear camp approximately 550 patients had been examined and 110 considered in need of major ear surgery. During the course of the camp a total of 104 major ear operations were undertaken, including myringoplasty for tympanic membrane perforations, and mastoidectomy for cholesteatoma. 7-30am depart from hotel to eye hospital by car or bicycle. The work of the camp is intense, and a strong ethos of teamwork is necessary. Minor illness such as GI upsets and respiratory tract infections are common amongst the team but do not disrupt the work of the camp. There is no doubt that the NHS benefits from the positive experience that members of the team invariably report. On the last day of the camp a stocktaking exercise is undertaken to calculate supplies that are necessary for the next camp in March 2008. All equipment is disassembled and packed away. The team returned to Kathmandu on Tuesday 4th December. As a way of winding down and relaxing the team undertook a memorable cycle ride known as the "Himalayan Downhill Dream". BRINOS would like to sincerely thank the BMA / DOH / RCN Humanitarian Fund for supporting the 34th Ear Camp. The charity relies solely on fundraising and donations for its work. If you would like to help, please visit the "Funding and Donors" page on this web site www.brinos.org.uk for further information.